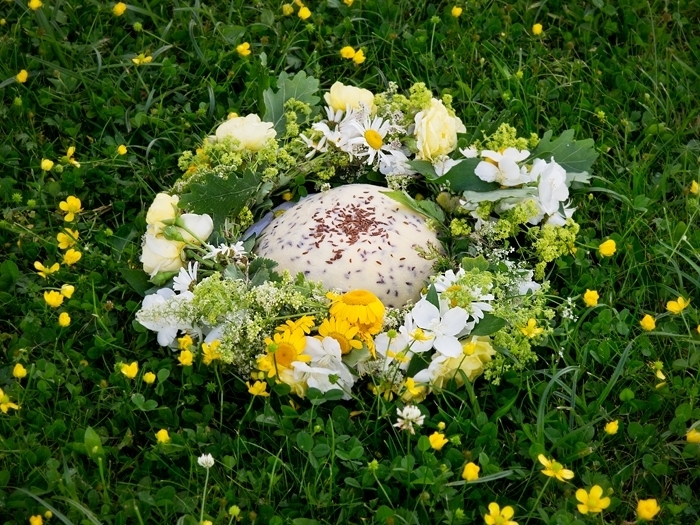 Jāņi cheese is a Latvian sour milk cheese, traditionally eaten on Jāņi – the Midsummer celebration. Today it is available and well demanded all year through. 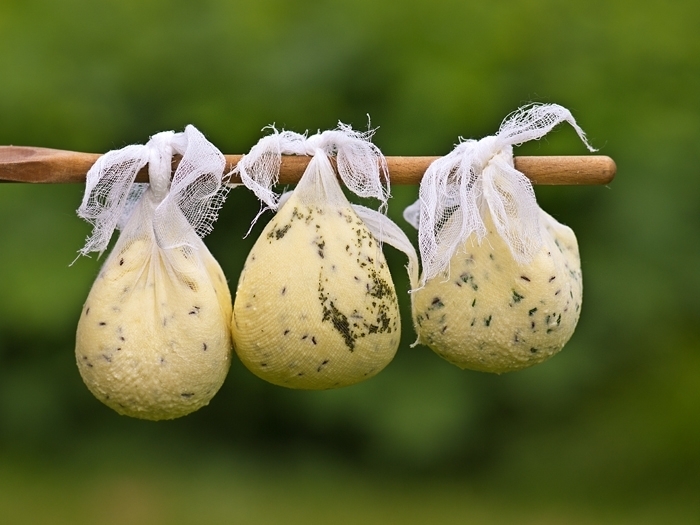 Its basics are raw quark and fresh milk, but other products like eggs and butter can be added to taste. 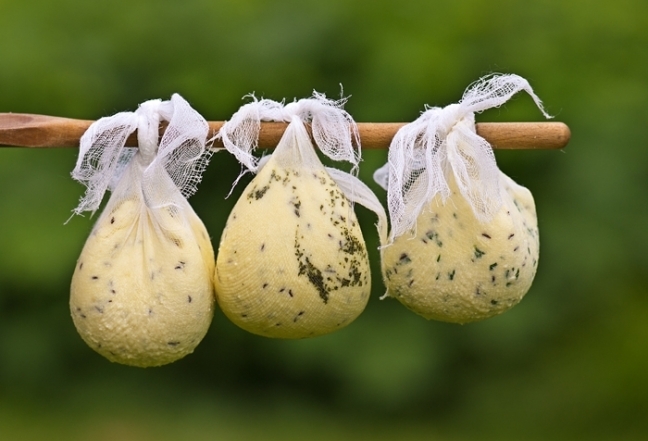 Traditionally, caraway seeds are added as spice but today cheese makers compete in creativity to make new varieties and tastes based on the original Jāņi cheese. 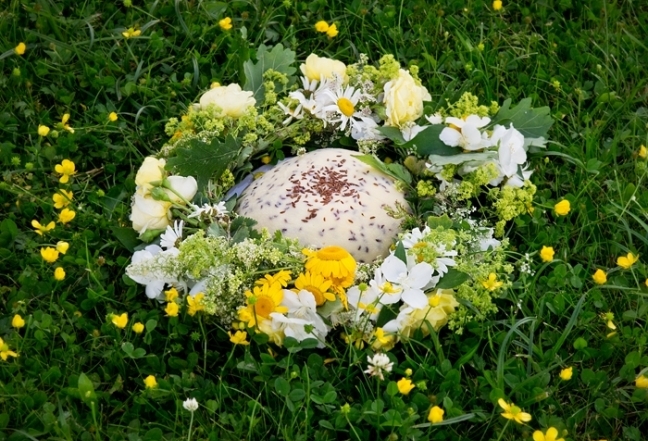 With its round form, the cheese symbolises the sun and is related to summer solstice rituals. The cheese is often served as a snack to go with light or dark beer. Bring water and milk to boiling in a cattle. Stir in some quarks. When it all gets lumpy, add slightly whipped eggs and caraway seeds. Take a colander and line it with a cheesecloth. Poor the mass into the colander and dry it rolling from side to side. Then put it back in the cattle, add some salt and heat up stirring until you get a homogenous substance. Put it in the cheesecloth, make a round shape, twist the cheesecloth corners in the middle and press into the cheese. Put the cheese under pressure between two plates or boards and keep until it gets cool and stark. When you open it, use the hollow in the middle to put in some butter. Smear it on slices of the cheese to enjoy the true taste!